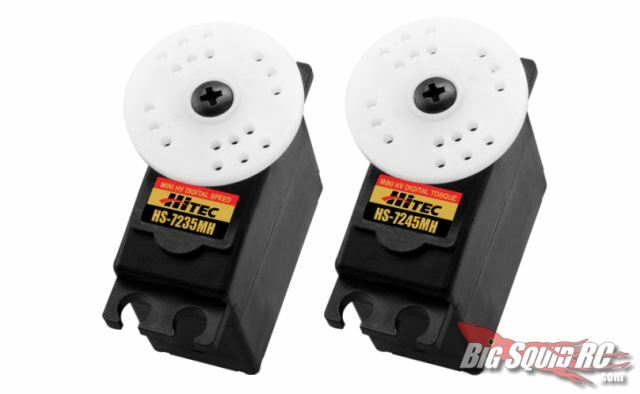 Hitec’s new, speedy servos « Big Squid RC – RC Car and Truck News, Reviews, Videos, and More! Hitec does one thing really well, release a lot of new servos. Here’s their latest, the HS-7235MH and HS-7245MH. Both of these are high voltage, coreless mini servos suitable for smaller scale cars and trucks as well as light planes and helis. At 6 volts the 7235 is rated at 50 oz-in with a transit speed of 0.09 second and the 7245 does 72 oz-in @ 0.13. Step that up to 7.4v and they go to 61 oz-in @ 0.08 and 89 @ 0.11. Both feature metal gearsets for extra durability and ball bearings for smooth operation. They still aren’t listed yet, but keep an eye on Hitec’s website for more info.